5. PVC-free and BFR-free models of electronic products on the market. 1. Support for individual (financial) producer responsibility – that producers finance the end-of-life management of their products, by taking back and reusing/recycling their own-brand discarded products. 2. Provides voluntary takeback and recycling in every country where it sells its products, even in the absence of national laws requiring Producer Responsibility for electronic waste. 3. Provides clear information for individual customers on takeback and recycling services in all countries where there are sales of its products. Greenpeace places greater stress on the chemicals side, arguing that “…until the use of harmful substances is eliminated in products, it is impossible to secure ‘safe’, toxic-free recycling.” Well, that is probably sensible — especially in the context of Latin America and the Caribbean (LAC), where recycling is still in its early stages and the infrastructure, public or private, would only ensure partial diversion of EOL electronics for several years to come. Probably better to phase out the toxics where possible. I find it interesting that Greenpeace’s criteria focus so heavily on PVC and BFRs, when use of heavy metals in components (including batteries) remain a significant issue in scrap electronics in places like the LAC nations. For this first edition of the “scorecard,” Greenpeace used only information publicly available on their company websites. In future updates — planned for every quarter — Greenpeace may use other, unspecified, sources. If it decides that corporate websites have provided inaccurate or misleading information (GP puts it more colorfully: “…if Greenpeace finds a company lying, practising double standards or other corporate misconduct”), points will be deducted from the score of the offending firm. None earned a true “green” rating. What gave Nokia and Dell the top spot? Both have good e-waste/recycling policies, says Greenpeace, and Nokia already has PVC-free phones and will phase out BFRs by 2007, while Dell has set itself ambitious chemical phaseout targets. What about the lowest-rate firm, Lenovo? How did the Chinese computer firm (who bought IBM’s PC line) earn its spot? GP gives it a few points for chemicals management (a legacy from IBM) and for instituting some voluntary product take-back programs here and there, but says they have a ways to go to catch up. In its press blitz about the report, Greenpeace focused much of its criticism on Apple. “It is disappointing to see Apple ranking so low in the overall guide. They are meant to be world leaders in design and marketing, they should also be world leaders in environmental innovation.” said Iza Kruszewska, GP International’s toxic campaign spokesperson. This chiding has been parroted by some media and many blogs, I think because recent Apple marketing campaigns have so heavily stressed their design superiority and taken a “holier-than-thou” tone toward PCs, and because they remain sensitive to public opinion in their scramble to improve market share. For my part, I am disappointed that Greenpeace did not focus more in the report on how these companies manage their production facilities and market chain in developing nations such as those in Latin America and the Caribbean (LAC). In their first report, I found only one reference to LAC — a complaint that HP did not provide information to consumers on take-back programs in LAC nations. Why did GP not raise this issue about the other 13? Some have programs in LAC, true, but they are spotty, not truly operating in all (or even most) nations and sometimes not operating at all outside the largest cities. Even those with programs do not make it easy for consumers to find out how to turn in their used electronics. Take, for example, GP’s #1 rated firm, Nokia. If you go to Nokia Brasil’s website, they proudly talk about their recycling program for cell phone batteries (required by Brazilian law, by the way!) and have a spiffy Shockwave animation on the importance of recycling cell phone components and packaging, but when you click on the link for the contact information for the list of “Authorized Technical Assistance” regional representatives, you come up with a page that tells you how to deal with their phone’s SIM card error messages, but nothing about who to contact to recycle your phone in Brasil. If you go to Nokia Argentina looking for such information, you are redirected to Nokia’s Latin American regional site, which yes has a recycling page, but no, provides no useful information on how to recycle Nokia phones in the region. I am utilizing Nokia just as an example. They are by no means alone in this. I’d like to see Greenpeace press companies more on providing verifiable information on their performance outside OECD nations, namely the LAC nations. They would be providing an invaluable service by doing so. They certainly have the offices and personnel in the region to do it. If they chose not to, maybe someone like the Ethos Institute (in Brazil) or the Friends of the Earth (FoE) affiliates can do so. Or maybe, just maybe, some of the other national NGOs in these regions can do their own national versions of this report, utilizing similar (or perhaps better!) criteria. 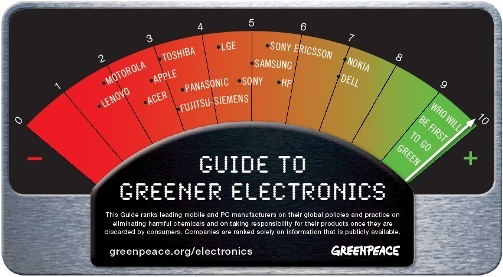 Greenpeace hopes that the quarterly reports will spark widespread consumer and media scrutiny of the chemicals and e-scrap management performance of these manufacturers, sparking a race among them to secure top ranking. Maybe. Depends on how Greenpeace tweaks their criteria and their reporting matrix, and expand to more information sources (they cannot continue to rely on company website reporting alone), preferably verifiable sources. From what I have observed from past such experiments in getting corporations to account for their policies and practices (and I’ve witnesses many on a wide variety of issues), this is more likely to spark an industry effort to produce their own criteria and public reporting system on chemicals and waste/recycling. Let’s hope that if they do, it includes more than just North America, Japan and Europe.